Electricity wires hang dangerously over a bituminous road. Unending rows of gigantic windmills look down from where, perhaps, a tiger should have kept an eye on its territory. Instead of birds, turbines create a humming noise. Trees are hardly in sight and one has to be lucky to spot wildlife. The Vankusawade plateau in the Koyna Wildlife Sanctuary in the Western Ghats of Maharashtra hardly looks like part of a wildlife sanctuary. 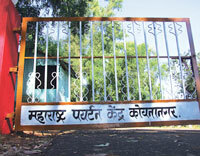 Situated in the Patan and Jawali tehsils of Satara district, Koyna was declared a sanctuary in 1985. It is a part of the Sahyadri Tiger Reserve, declared in January 2010, and is proposed to be its core area. The government has proposed to UNESCO to enlist the sanctuary as a world heritage site. Bedecked with dense forest and rich biodiversity, the 42,355-hectare (ha) sanctuary now also has 215 windmills and 10 tourist resorts. An earthen dam is under construction and trees are being felled rapidly. Land inside the sanctuary is up for sale. More than 900 land deals have been finalised since 1985. And, it is the sanctuary authorities who have helped make a lot of this possible. The road, the dam and a resort belong to the state government. The Wildlife Protection Act, 1972, bans infrastructure development and sale or purchase of sanctuary land. An RTI application filed by Karadbased non-profit Creative Nature Friends in March last year revealed that 215 of the 1,240 windmills in Satara lie inside the sanctuary precincts. They are owned by industrial powerhouses like Tata Motors, Bajaj Auto and pan masala giants Dhariwal and Ghodawat. 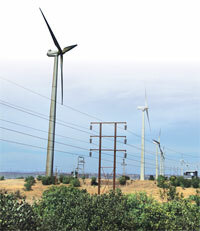 Construction began in 1999-2000 and Rs 500 crore was spent on the 215 windmills. These can generate 80 MW of power. Nana Khamkar, a member of the non-profit, filed complaints in the Bombay High Court in August 2010, and the Central Empowered Committee (CEC) in October that year. The CEC gives recommendations to the Supreme Court on forest-related matters. On the high court’s directions, assistant conservator of forest of Koyna issued eviction notice to owners of the windmills on November 20 with a 60-day deadline. The Indian Wind Energy Association filed an application in the court stating that owners of the windmills had taken all the required permissions. It stated that the state government neither objected to nor warned them of the land being inside the sanctuary. The court has directed the wildlife department to hear the windmill owners before taking a decision on eviction. The RTI replies also revealed that 10 resorts were built inside the sanctuary between 1997 and 2007. Of these, one belongs to the Maharashtra Tourism Development Corporation. Close associates of the state’s politicians and businessmen are said to own the rest. No permission was sought from the wildlife department for the resorts. In 2006, a 6.5-kilometre road was laid inside the sanctuary under Pradhan Mantri Gram Sadak Yojana. The RTI replies revealed massive felling of trees in the wildlife corridor between Koyna and the nearby Chandoli National Park. Last month during its visit to the sanctuary, the CEC noticed a dam under construction near Humbarli village. It is being built since 2001 at a cost of Rs 6 crore by the Kanhar Development Division, another state government agency. Permission from the wildlife department, again, was not sought. It is not just construction, sanctuary land itself is up for sale. “Till about two months ago ‘land for sale’ signboards were common in the sanctuary. 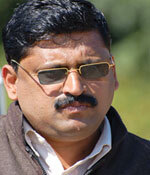 They were removed and sale of land stopped just before the CEC’s visit,” Khamkar said. Records show 950 first-hand land transactions since 1985. It is estimated that 10 per cent of the sanctuary land, which comes to about 4,000 ha, has been sold or encroached. Dulta Chalke, resident of Vankusawade village inside the sanctuary, said the sanctuary sees more investors than tourists. “Two to three buyers come every day to negotiate deals with villagers. Buyers offer price as high as Rs 2.5 lakh per acre (0.4 ha). Around 20 per cent of the villagers have already sold their land,” he said. The mad rush for land in Koyna is because of its potential to emerge as a tourist hub. The lush forest around the backwater of Koyna dam makes the sanctuary a much sought-after tourist destination. The high altitude of the eastern plateau (1,000-1,250 metres) accompanied with high wind speed makes it an ideal location to install windmills, which in turn add to the tourist attraction. Considering this, and to reduce tourist pressure in Mahabaleshwar, the state government envisaged a Rs 678-crore New Mahabaleshwar Hill Station project near Koyna in 2001. The project, finalised in 2004, proposed to include 14 villages of the sanctuary. Soon after the project was envisaged in the power circles, there was a sudden surge of land deals. Records of Patan tehsil show 70 per cent land deals were finalised after 2001 (see map). Registered under different names, the actual buyers are politicians, businessmen and Bollywood stars, sources said. Instead of following the law, the revenue department allowed sale of land, while the wildlife department preferred to look away. In fact, government agencies developed the sanctuary’s infrastructure to facilitate the investors, allege activists. The bituminous road was to show infrastructure in the area to help windmill owners get clean development mechanism approval from the United Nations Framework Convention on Climate Change, Khamkar said. This helps them trade in carbon credits in the international market. “The minor irrigation reservoir in Humbarli village was constructed to ensure water supply in the resorts,” he added. The sanctuary itself has not been notified despite being declared 25 years ago. As per the wildlife Act, the subdivisional officer (SDO) must prepare a report of the rights of people living in the sanctuary area and issue the final notification. In the report, prepared in 1998 and amended twice in 2000 and 2002, the SDO proposed to exclude nonforest area of the 14 villages. These were the villages where maximum land deals took place later. The exclusion is on hold as final notification has not been issued yet. Once out of the purview of the wildlife Act, the area will be free to be exploited. M K Rao, conservator of forest of Kolhapur division and officer in-charge of Koyna sanctuary, said the land deals were because of “ignorance among the frontline staff”. “Wildlife Act has been amended so many times that the staff was not aware of them. They were also poorly informed about the boundaries of the sanctuary. The staff did not know about the irregularities,” Rao said. The RTI reply accessed by Khamkar shows the department knew about the constructions. In 2002, an offence was booked by range forest officer in Koyna against 159 windmill owners. In 2004 when the bituminous road was being constructed, the conservator of forest in Kolhapur wrote to the executive engineer of Satara informing him about the prohibition. But no action was taken. “We had been watching windmills and resorts for years,” said Khamkar, “but nobody knew they were inside the sanctuary. It was only after we saw the map of Sahyadri Tiger Reserve which had Koyna as its core zone that we doubted the activities”. When the CEC team visited the sanctuary, the authorities took them through a route that was not encroached. The way to the dam under construction in Humbarli village was blocked by boulders. The state government declared Sahyadri Tiger Reserve comprising Koyna sanctuary and Chandoli National Park in January 2010. The Koyna sanctuary now encompasses a critical tiger habitat. A part of the Congress-NCP government has opposed constitution of the reserve as it may put a spanner in the New Mahabaleshwar Hill Station project. Officially, Koyna has three tigers and Chandoli six. Villagers say there are more. Land deals, tourist resorts and massive felling of trees near Navja, Gokul and Humbarli villages have shrunk the wildlife corridor between Koyna and Chandoli putting the big cats at risk. The sanctuary has been declared an Important Bird Area by BirdLife International, a global network of bird conservation organisations. It has endangered bird species like red-headed vulture and white stork. But the windmills have disrupted birdlife. Their constant drone keeps the birds away. “This is evident from the fact that the plateau is full of rats now,” said Mohan Maruti Maskar Patil, a journalist in Satara who studied the impact of windmills on wildlife. The Vankusawade plateau is also known for its unique biodiversity. “The overhanging cliffs, fallen boulders and small caves provide shelter to endemic species like Koyna Toad and the rare Draco (gliding lizards). The Draco has not been seen around in many years as windmills encroached its home,” said Rohan Bhate, a naturalist in the region. The wild animals of Koyna, weighed down by dense canopies and high rainfall, move towards the plateau during monsoons. But the windmills force them to the villages nearby leading to conflicts with people. “Due to mismanagement, the authorities have managed to create a dangerous situation for both man and animal,” said Rithe. In India. the government has always been hostile to our environment and cultural heritage. Every politician is for sale and so are the policies which are drafted to suit the interests of a few. Every wildlife sanctuary in India has the same story. Why can't we leave the animals alone? There should be complete ban on resorts and any human activity inside the sanctuaries. Even jeep safaris badly affect the behavious of animals. Tourism should also be restricted. If things go on like this, there would not be any wildlife left. We talk about tigers alone but perhaps it is right time to realize that other wild animals which were a common sight once are fastly becoming extinct. Nice effort for the story. After this i realize that after some years wild animals will come in front of us as " O se Okhali " in nursary Pahara. we taught our children but actully we also never seen Okhali in our life. im dont know wht could i do for it ..but i promise to do some thing for it....! I am trying to investigate the land deals. If you have any details, please do share with. Can somebody tell the names of these wind energy companies? I really appriciate the efforts of Mr. Nana Khamkar and the story writer... But can we have a look at other side of the story? The intention notification for Koyna Wildlife Sanctuary was declared in year 1985. thereafter in 1998, 2000 and 2002 the inquiry proceedings were conducted by the designated inquiry officers and the non-forest area from the Intention Notification was excluded from the sanctuary area as people from this area were resettled for 2 times first for building 'Koyna Dam' through which 40% of Maharashtra electricity is generated and second time when massive earthqueck took placein 1965. Till date the resettlement of people in the area is pending since 1952. Thereafter came the Sanctuary Declaration. Though the Inquiry Process has been completed, the Forest Department is not pushing the final declaration of Koyna Wildlife Sanctuary for want of funds. Since 1985 all the natives from the area, have uncertain future, no roads, no hospitals, no schools, no water pipelines, no electricity, nothing till 2002. So finally after exclusion of the non-forest area from the Notification people in the area started development. Nana Khambkar himself was one of the key role player as a PA to the Representative of Lok Sabha to bring the Wind Mills in the area. We can also provide the photographs to that effect. All the windmills, resorts and roads have come up in this excluded area from the proposed Protected Area. In the absence of which, people would have again shifted to the forest produce for their livelihood sources. The whole issue is pending before CEC and the High Court wherein Forest Department other than issuing noticies to the Natives, unable to show any offences. Forest Department is interested in getting funds rather than protecting forests and Nana is more interested in the resortes built by political rivals of his 'Aaka'. Unfortunetly he is not aware that the whole land on which resorts are standing is private land and to which 'No Objection' certificates have been issued by the 'Forest Department' way back in 1989. So no doubt the natives have till date protected the Sanctuary are and not the appointed 5 forest guards for 426 Sq. Km area. Even after facing continuous hardships, native people say they want Wild Life Sanctuary to come up as it is their wealth and livelihood. To conserve the area properly, the forest department and the government should understand the participatory mechanism and then only the real conservation can take place. We are regular readers of Down to Earth and true believers of its authentic research before coming up with an article. But in this case we are really disappointed and now feel that we should counter check the issues and opinions of the writers. Many a times article writes are swayed to hear stories from one source and project what they hear as facts. I am a nature lover and have studied these areas well. While the need to protect tigers and other flora and fauna is mandatory, we cannot give in to some people calling themselves as friends of nature and carry on other interests. Let us do an analysis of this area. The villages and development to the east of the catchment area is the one under protest? then the fact is that there is no tiger or even any endangered ones existing these areas. 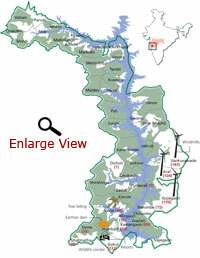 Most of them after the dam was developed have migrated to the west of the catchment in early 1960s. The Govt when the dam was built shifted the villages which were getting submerged from the catchment areas to the east of the catchment as they were low density of forest and was closer to the inhabited areas of Satara town and other villages. Coming to the wind mills, one cannot generate power by keeping a wind mill on your backyards. You need to place them where wind power is available. The present location of wind mills were selected keeping in mind of these factors. Another claim of wildlife getting effected by development has to be addressed by population control. As the future requirement of land will be more with ever increasing population. This fight for land between forest and development will continue without controlling that. By highlighting the Tiger issue Nana want to win the heart of those who have never seen the area and the ground realities. Media persons are of hire/sale depending on what one wants. If you ask anyone of those who reported to provide proof they will fall back on those who made falls claim. I think responsible reporting is the basics for true information and wisdom sharing to public at large. Do not report untill one verify the ground realities. Unfortunately, Bhimashankar hills and reserve is also getting into the same league. Though its not a part of Sahyadri Tiger Project, its indeed a sublime forest and should have remained/maintained the way it was a couple of decades ago. what do the ten resort owners propose to show the tourists, the artificial windmills and their constant humming? do these people actually use their thinking abilities before venturing for something like this? if part of the area was proposed for tourism to reduce tourism pressure in Mahabaleshwar, then what is the point in driving away the tourist attractions i.e. the floral and faunal biodiversity, by permitting installation of windmills in the region? totally beats me. and how is the state government operating at its will and whim and selling the forest land, when the matter is of concurrent significance, given the fact that it is under project tiger? looks like the central government has turned a complete blind eye towards the matter or who knows may be they choose to consciously overlook the matter.